Traditional Chinese Medicine (TCM) is a complete healthcare system that has been used in China and other asian countries for the past 5,000 years. TCM includes acupuncture, Chinese herbal medicine, Qi Gong, massage, and diet and lifestyle guidance. Acupuncture is part of a Chinese healthcare system that has been around for at least 5,000 years, making it the oldest and longest-standing healthcare system in the world. It is used to re-balance disharmonies within the body and maintain overall health for the body, mind and spirit. Its holistic approach offers a very safe and effective treatment for all ages from infants to the elderly. Treatments are not only focused on treating an already existing health condition, but also on the prevention of diseases. Unlike the Western medical system that focuses treatment on the branches of illness, acupuncture focuses on treating the root of the condition so it will be eliminated completely and successfully. What is Qi and How Does It Affect My Health? When we are in good health, we have an abundance of Qi (pronounced chee), our “vital energy” that flows freely within the body through our meridians (a network of channels within the body). When Qi becomes blocked or insufficient within the meridians, the body does not maintain balance and harmony, this will then result in illness and disease. The proper flow of Qi is affected by poor diet, stress, lack of exercise, overwork, weather, pathogens and environmental conditions as well as any lifestyle factors that can cause disharmonies within the body. A practitioner of Chinese Medicine determines the imbalances by taking a close look at not only the presenting signs and symptoms of the condition, but the patient’s medical history, constitution, tongue and pulse. Very fine needles are inserted into specific sites (acupuncture points) on the body along the meridians and stimulated to clear obstructions, improve circulation and re-establish proper flow of Qi. Once balance is regained, illness is no longer present. Other modalities of stimulation to regain proper flow of Qi include moxibustion, fire cupping, electro-stimulation, gua sha, ear seeds, and massage. Traditional Chinese Medicine and acupuncture are used to treat a full spectrum of ailments that include anything from a cold/flu to autoimmune disorders, insomnia, acute or chronic conditions, as well as mental/emotional issues. Kristy Kure is a California Licensed Acupuncturist (L.Ac.) and avid believer that healing begins from within. From childhood, she always knew she wanted to be involved in people’s lives in a positive way. Not knowing where that would lead her, she was introduced to Chinese Medicine in her early 20’s to treat musculoskeletal issues due to a spinal cord injury that left her partially paralyzed. 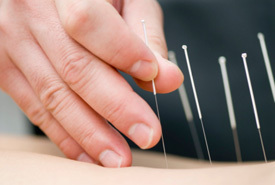 After her first acupuncture treatment, she felt immediate relief of muscle tightness and pain. That peaked her interest to learn more about this fascinating medicine. After reading about the philosophy of Chinese Medicine and learning the degree of power and true beauty this medicine has to offer, she knew this would be the path she would take to have positive influences on people in need of care. At that point, her journey began to become a Licensed Acupuncturist. Kristy earned her Master’s Degree at the American College of Traditional Chinese Medicine (ACTCM) in San Francisco. While attending school, she also became a Certified Massage Therapist (CMT) in Shiatsu. She received clinical training at the ACTCM Community Clinic, California Pacific Medical Center, Jewish Home for the Aged, Lifelong Berkeley Primary Care and had extensive training at Zhe Jiang Chinese Medical University in Hangzhou, China. As a healthcare practitioner, her focus is to give relief of symptoms and treat the numerous conditions that affect our health daily. She does this by re-establishing balance and order within the body, bringing equilibrium back when harmony is lost for optimal health and well-being. Treating long standing illnesses as well as prevention of illness is a major focus of practice. If you would like to schedule an appointment, give our office a call or just stop by. Kristy would be so pleased to meet you and answer any questions you have!